This semester, some Peek in the Stacks blog posts will be authored by CSUN students who work in Special Collections and Archives in the Oviatt Library. This week's post was written by Tanner Gilliland-Swetland, a student assistant in the Urban Archives. Tanner is majoring in Political Science with a minor in Art, and plans to pursue a career in fine arts after obtaining a Masters of Art in sculpture. Gilbert G. Benjamin, Jr. began working for the United States Federal Bureau of Investigation in 1946, and was posted in both Virginia and Washington D.C. before being transferred to Los Angeles in 1957. The Gilbert G. Benjamin Jr. Subversive Activities Collection documents his work in Los Angeles, and includes documentation of communist and other subversive activities across Southern California. 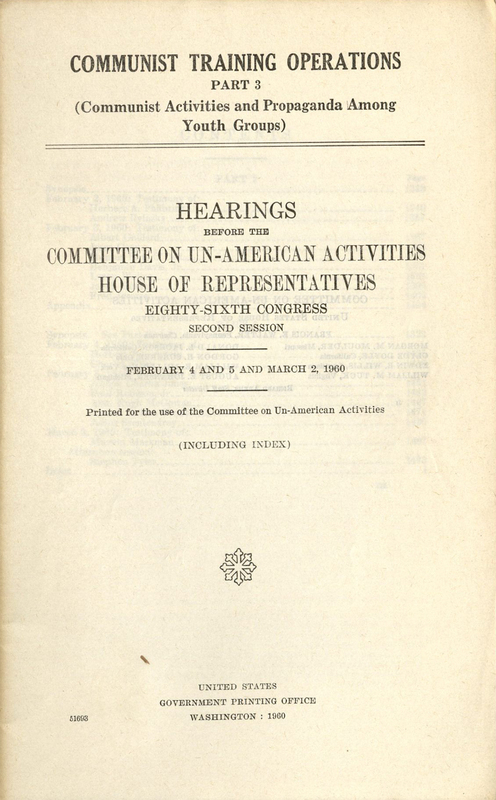 The collection includes transcriptions of proceedings and materials created by the House Un-American Activities Committee (HUAC), and distributed to the public at the height of the Cold War during the 1950s and early 1960s. 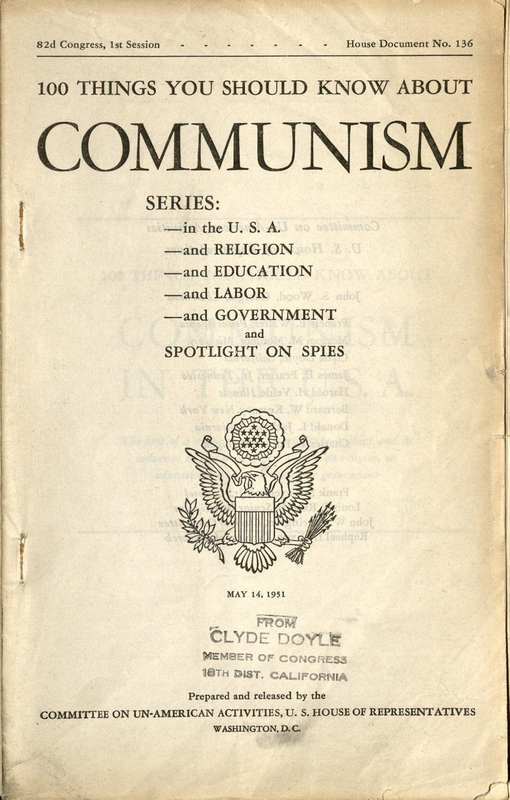 An investigative committee of the US House of Representatives, HUAC was created in 1938 to investigate private citizens and businesses with communist connections. 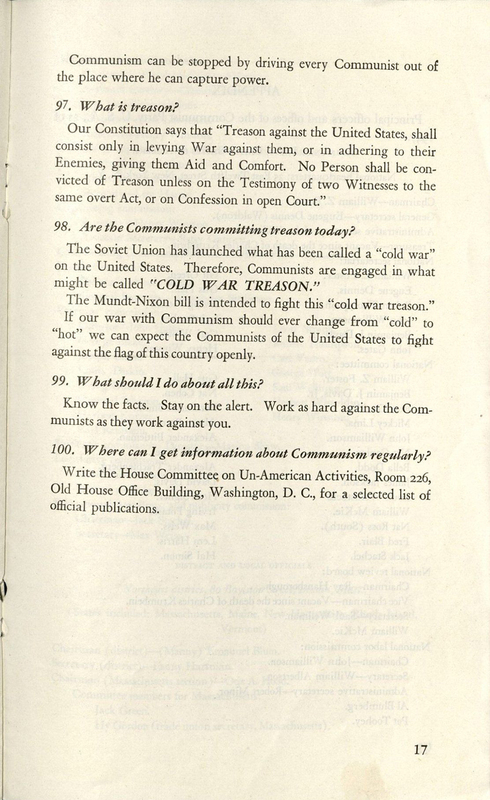 In 1945, as World War II drew to a close and the Cold War began in earnest, it became a standing, or permanent, committee. "I don't know who I could obtain as council in the city of San Diego… an individual attorney would not care to come here and represent me, and the reason he would not is because he knows the very procedure and tactics of this committee would cause a calumny that would destroy most of his practice and destroy most of his income." Throughout the process, Alexander cited the First, Fifth, Sixth, and Eighth Amendments in refusals to answer questions, as well as the ruling of the Supreme Court in the case of West Virginia Board of Education v. Barnett (1947), which states "If there is any fixed star in our constitutional constellation, it is that no official, high or petty, can prescribe what shall be orthodox in politics, nationalism, religion, or other matters of opinion, or force citizens to confess by word or act their faith therein." 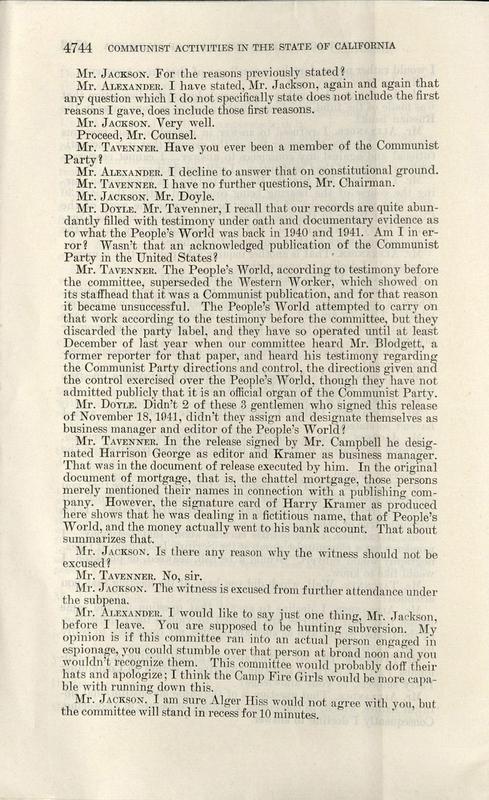 After much questioning Alexander finally made a statement in response to a question, "After all, I fought in the Army of the United States and I don't intend to be pushed around by you," and concluded the interrogation by telling Representative Donald L. Jackson (R-CA), "I would like to say just one thing, Mr. Jackson, before I leave. You are supposed to be hunting subversion. My opinion is if this committee ran into an actual person engaged in espionage, you could stumble over that person at broad noon and you wouldn't recognize them." 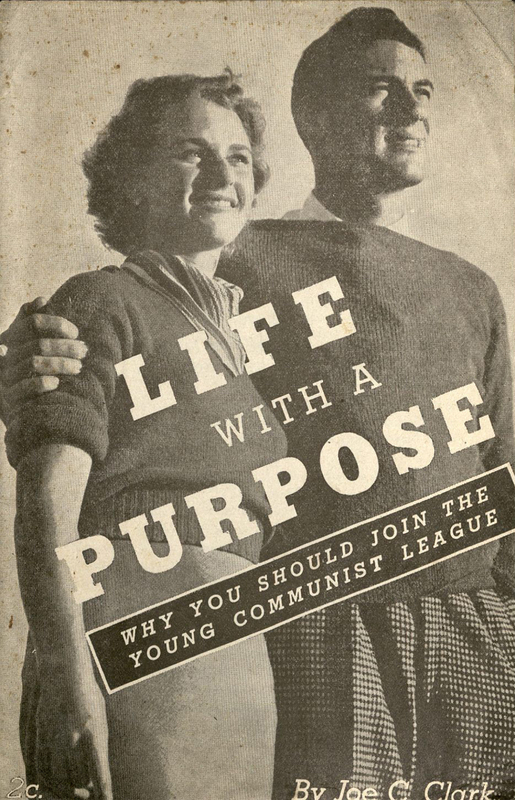 In addition to the HUAC hearings, the Benjamin Collection also contains accounts of communism experts, including Peter S. Deriabin, a defector from the Soviet Union and ex-officer of the Committee of State Security (KGB); investigations into youth movements; Hollywood; the Black Panthers, and; HUAC's own anticommunist publications. 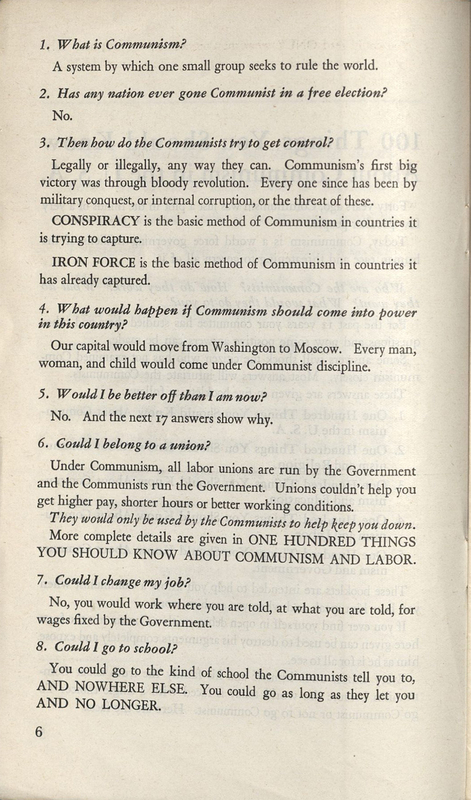 It also includes statements made in the Congressional Record by Senator Thomas J. Dodd on the Vietnam War, and reports and statements given by J. Edgar Hoover, Director, Federal Bureau of Investigation to the House Un-American Activities Committee.